The TPP is presented as opening up trade between the Pacific nations, but the sub-text is preserving first-mover-advantage. The main thrust of the TPP is intended to extend the rule of law to cover intellectual property. A secondary purpose is to stop nations from passing laws that hurt an already established advantage in the market place. In other words, to preserve whatever first-mover-advantage has already been earned (or achieved by whatever means). It may not have been the clearly thought through intention of the legislators, but the outcome is to ensure that nations that are already poor remain relatively poorer than the richer nations. In Australia, we have the naive dream that we will be a supplier of intellectual goods to Asia. If this dream is realized, what is the result for Asia? Are all Asian supposed to be satisfied with supplying cheap consumer goods to Australia, while the Australians supply the more expensive and more profitable intellectual goods to Asia? At least, if the TPP deal is agreed in the USA, then Australians will be able to hang onto whatever first-mover advantage it has, and the Asians will be the poorer as a result. The USA is beginning to feel the first winds of change resulting from the availability of cheap Asian goods. Its leaders also have a dream of hanging onto their hard-won first-mover advantage, which they hope will ensure that alternative jobs will become available from those that are lost. This, of course, is a forlorn hope, as current experience with structural unemployment in the USA has already shown. Nevertheless, despite the weakness of the case for even more free trade, the intention of the TPP is to ensure that the developing and emerging nations will remain on the teat of the West for intellectual property for as long as this can be sustained, thus keeping them relatively poorer than the West. Any newly emerging nation would know that an existing first-mover-advantage is very difficult to overcome. It was an issue faced in the USA during the 19th century, when the cloth and clothing manufacturers on the US east coast found that they could not compete on a “level playing field” with the British manufacturers. Those politicians in the US who wanted to build up a US manufacturing industry argued for the imposition of tariffs. Eventually the advocates of the so-called American System, which involved introducing tariffs, won the political argument, and the USA went on to become a manufacturing power-house. As a consequence, UK manufacturing dominance came to an end. It was a hard-fought fight, even though it is obvious to us now that the advocates of the American System were in the right. China has its own strategies for overcoming first-mover-advantage. This involves a combination of tariffs, subsidies and other protective measures to support its developing and established industries. It is also claimed that the Chinese use industrial espionage and the blatant stealing of secrets to leap-frog the hurdles standing in the way of developing high-tech industries. The TPP is designed to counter both of these, at least within the developing nations that are signatories to this deal. So, if tariffs and cheating are not open as a means of overcoming first-mover-advantage what are the options for developing nations? If anyone knows what they are, please comment on this post. Advocates for Free Trade often argue that it lifts poor nations out of poverty. This is only partially true; and has a very limited impact. The wages in Bangladesh for textile workers have increased from $1 day to $2 day as a result of increased exports of finished garments. Yet any attempt to push wages higher, towards Western standards, is met the fierce resistance from the textile manufacturers. They probably use the argument that an increase in pay like that will make them noncompetitive. So unless Bangladesh can come up with new industries in which they can compete, so that there are other opportunities for the Bangladeshi people to gain work at higher pay, it looks like the future for wages in Bangladesh is likely to stop at a maximum of $5 day. Also, the advocates of Free Trade are unlikely to be the workers who will be the first to be displaced in Western nations. If Western nations can claim to be virtuous by opening their industries to fierce competition from Asia (and from Mexico and South America), it is not the advocates of this policy that will bear the cost: it is the ordinary workers on those nations. These are the workers who are unlikely to get jobs in the “winner-takes-all” high tech jobs, such as in Apple and Google. Another fraudulent argument for Free Trade is to cite China as a shining beacon. Certainly it has benefited from the opening of trade in Western nations. But it has made the most of this situation by protecting its own industries at the same time. With this protectionism (and possibly cheating as well), it is unlikely that China would have been able to move hundreds of millions of workers from farms to the cities. It is not Free Trade on its own that has helped China to develop. It also required the Chinese government to look after the interests of its own people. The TPP is advocated on the basis that it will help developing nations to develop. In fact, what it is designed to do is to entrench privilege. This is not the privilege of entire nations, but rather the privilege of corporations. It is not privilege of all corporations that is being protected: it is the privilege of those corporations that have an edge that makes them the best in the world. I don’t want my world to be come a place in which only the “very best” or most successful have a reasonable share in its abundance. I want a world in which everyone has a fair chance of success, and a reasonable opportunity for each to share in the success of his or her own nation. That is why agreements like TPP are an anathema to me, along with anything that reduces the power of democratic governments to shape their societies according the needs and aspirations of their own peoples. The IPCC has published estimates of climate sensitivity of between 1.5 °C and 4.5 °C, but are unable to provide guidance on the likely actual level, whether it is in the middle of this range, or at either extreme. This is not science! How can it be refuted (i.e. tested) if the premier organization does not dare make a prediction? Therefore, it is not science, since there is not an explicit statement that can be tested, and if necessary, refuted. The expression “climate sensitivity” represents the warming theoretically expected if CO2 doubled from pre-industrial levels. The use of this expression might have been an attempt to make an indirect proposition more understandable to lay-people. If so, one can say that has been fairly unsuccessful, and I believe it has stifled understanding and debate, rather than encouraged it. In scientific circles, the effect of GHGs on the atmosphere is expressed more directly as “forcing” calculated as watts per square metre (W/m2). Scientists have calculated that the additional forcing for a doubling of CO2 will be 3.982 W/m2. (At least this part of the argument is reasonably treated as “settled science.”) So, expressing it another way, the IPCC are saying that additional forcing of 3.982 W/m2 is likely to result in an increase in global average temperature somewhere between 1.5 °C and 4.5 °C. Complicating the use of this expression of “climate sensitivity” is the fact that CO2 is not the only greenhouse gas (GHG). What they actually mean is that any increase of GHGs resulting in a total increase in forcing of 3.982 W/m2 is likely to result in an increase in global average temperature somewhere between 1.5 °C and 4.5 °C. 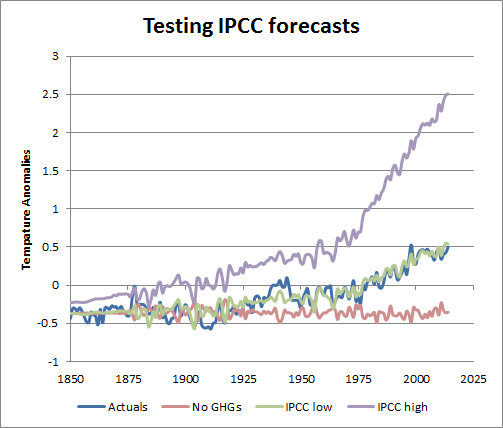 Converting the IPCC’s range of climate sensitivity into this new measure, we can say that the IPCC’s imputed estimate of this forcing multiplier would be from 0.38 to 1.13. Using the “forcing multiplier” we can directly compare forcing and warming. We know that the additional forcing (since industrialization) from all GHGs has been 3.05 W/m2. Over that period the global average temperature has increased by 0.94 °C (from -0.44 °C to +0.5 °C). This means that the observed forcing multiplier can be simplistically calculated as 0.94 / 3.05 = 0.31. Alternatively, using a more sophisticated calculation, taking into account a number of different variables, and every annual value from 1850 to 2014, we can say that the actual observed forcing multiplier is 0.37. We can see that the actual observed values for the forcing multiplier are slightly below the bottom end of the IPCC’s imputed range. Alternatively, we can just say that the observed climate sensitivity is slightly below the bottom end of IPCC’s range for climate sensitivity. This is a fact, but it is not something you are likely to find in a peer reviewed “climate change” journal. Currently there are no (accepted) scientific propositions to establish the forcing multiplier where both science and observations meet. We are in limbo on this subject. We can present this problem graphically. Here we show just how far the IPCC upper range estimate of climate sensitivity (or forcing multiplier) is from the actuals. From direct communications I know that some climate scientists are expecting ocean temperatures to gradually increase, with the equilibrium (higher) temperatures of the ocean taking centuries to be achieved. While temperatures in the ocean are probably lagging the land temperature increases, there is no observable indication in the following chart that such a “catch up” has had any effect so far. On the other hand, those who try to reproduce temperature data without taking into account GHGs will continue to struggle to win the argument. As can be seen, the other variables included here, like the 11 year sun-spot cycle, volcanoes, and El Nino, are not sufficient to explain the long-term trend of an increase in temperatures. If the forcing multiplier remains around the level of 0.38 per W/m2, the long-term strategy dealing with the likely continuing increase in global average temperature is clear. A steady reduction in CO2 emissions in developed nations (plus China) of about 2% per year is necessary. If, on the other hand, if the forcing multiplier rises to 1.13 per W/m2, as the IPCC seem to either expect or are not willing to dismiss, more radical action on CO2 will be required. Yet 165 years of evidence weighs against the wildest of the IPCC estimates. Accepting and acting upon an extreme estimate is likely to lead to extreme political difficulties right across the whole planet. The precautionary principle suggests we should wait for more definite evidence before acting on such unsupported claims. After BrExit, the EU and UK could impose complementary tariffs on each other’s exports at a non-discriminatory level, say 10%. EU tariffs, and balancing UK tariffs would help, not hurt, the macro-economics of both. Both the EU and the UK economies are unbalanced. Some parts of these economies are going very well, but other parts are struggling. Trade is the main cause of this imbalance. Reducing trade makes it more likely that a national government could regain control of its own economy. The continuing pressure to reduce comparative costs means that there is a growing trend for more concentration of manufacturing activity. This results in some parts of the each region booming, but other parts are left destitute. Yet “Cheaper prices for everything” is a mantra, not a complete policy. This is because it results in widespread and irreparable unemployment. It is only half a policy. A complete policy would attempt to balance employment and prices over time. 100 years of unemployment, as happened as a result of the Enclosure Movement, is not acceptable in a democracy, nor is it acceptable to most clear thinking adults. The EU is infamous for its agricultural subsidies. These reduce the prices of agricultural goods, but make farmers dependent upon government handouts, and therefore on the tax contributions of other taxpayers. It also is in flagrant breach of the spirit of the WTO rules on trade. If the UK did not grant its own agricultural producers EU-style subsidies, the UK could help its own farmers by introducing tariffs on all imported agricultural goods from every other nation. In addition, if the EU continues with their agricultural subsidies, the UK would be entitled to invoke anti-dumping penalties. With that prospect hanging over their heads, the EU may be prepared to consider allowing discriminatory tariffs to be imposed on EU exports of agricultural goods into the UK, over-and-above the tariff on agricultural goods from other nations. Quotas can have a place in food production since it is natural objective of every nation to maintain a large measure of self-sufficiency in food for cultural and defence reasons. Yet tariffs are more economically efficient than quotas. This is because they allow the market to establish a close-to-optimal division of labour between economic sectors. Quotas are not economically efficient. They can result in much higher prices of now-scarce goods, even leading to a doubling of prices. They can also result in super-profits for importers who have a licence to import up to the quota level, since they are now dealing in scarce goods.